They asked Richard if he could arrange a golf day for 16 friends. 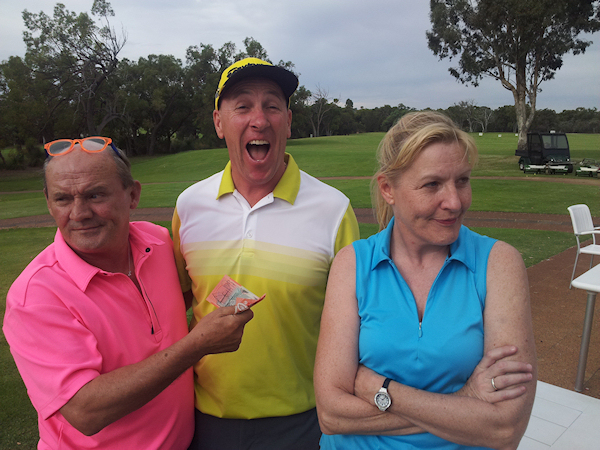 Being a keen golfer Richard didn’t need asking twice and went ahead and arranged a golf day at Carramar Golf Course. Imagine the surprise when Roy and Sue explained they were hosting the golf day for their clients.. “but you’re a UK based accountants, what client s do you have in Australia?” Roy replies “ our clients are on tour in Australia and playing in Perth for 5 nights, they are Mrs Brown’s Boys and the cast would like a round of golf” . Wow – How happy was Richard to be paired with The main man Mrs Brown himself Brendan and his lovely wife Jennifer. The photo shows who won and how very popular the winner was!! !